The controversy over the Bollywood movie Padmavati reached Haryana on Sunday with the BJP’s state chief media coordinator offering a bounty on actors Deepika Padukone and Ranveer Singh and director Sanjay Leela Bhansali. 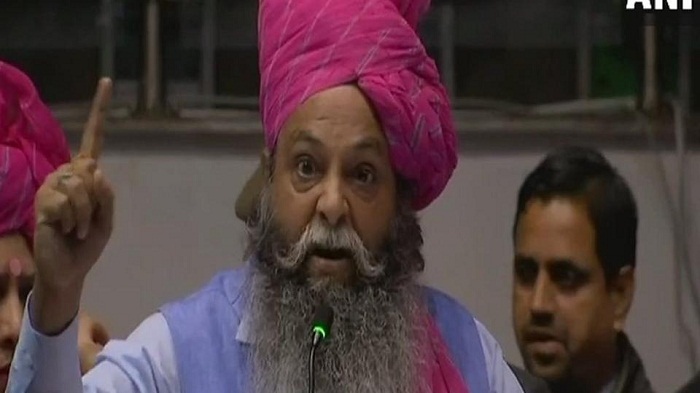 Suraj Pal Amu passed derogatory remarks against the trio, threatening them for the portrayal of Rajput queen Padmavati and Delhi sultan Alauddin Khilji. “If you do not take back your words, we will break your legs,” he said in Hindi, addressing Singh who supported filmmaker Bhansali. Taking his threats further, he praised the Meerut youth from Rajput community who announced a Rs 5 crore bounty for beheading Padukone and Bhansali. “I want to congratulate the Meerut youth for announcing Rs 5 crore bounty for beheading Deepika, and Bhansali. We will reward the ones beheading them with Rs 10 crore, and also take care of their family’s needs,” he said. Earlier in the day, the makers of the film said they had decided to defer its release. In a statement, Viacom 18 spokesperson said the studio had made the decision “voluntarily”. The film was due to hit theatres on December 1, 2017. Trouble began after the Rajput Karni Sena, a fringe group, demanded a ban on the film because it “distorted history”. Bhansali has repeatedly denied this charge while the makers reiterated that the film was a cinematic masterpiece capturing “Rajput valour, dignity and tradition in all its glory”. Earlier this year, Bhansali was even roughed up by the Sena members in Jaipur and the film sets vandalised during shooting. Bhansali and Padukone received have also been receiving threats and their security has been beefed up. The film fraternity came out in support of the movie, with many leading artistes calling it an attack on creative freedom. However, some political outfits demanded that the release be deferred in view of the Gujarat assembly election. Last week, the film certification board returned the movie’s application to its producer stating it was “incomplete”. On Saturday, Rajasthan chief minister Vasundhara Raje also weighed in, asking Union minister Smriti Irani to ensure the movie was released only after necessary changes were made, keeping in mind that no community’s sentiments are offended.